Hello from Norway. We’re here in the middle of winter chasing the Aurora Borealis (Northern Lights). Hopefully we’ll get lucky and see it. I’ll let you know. 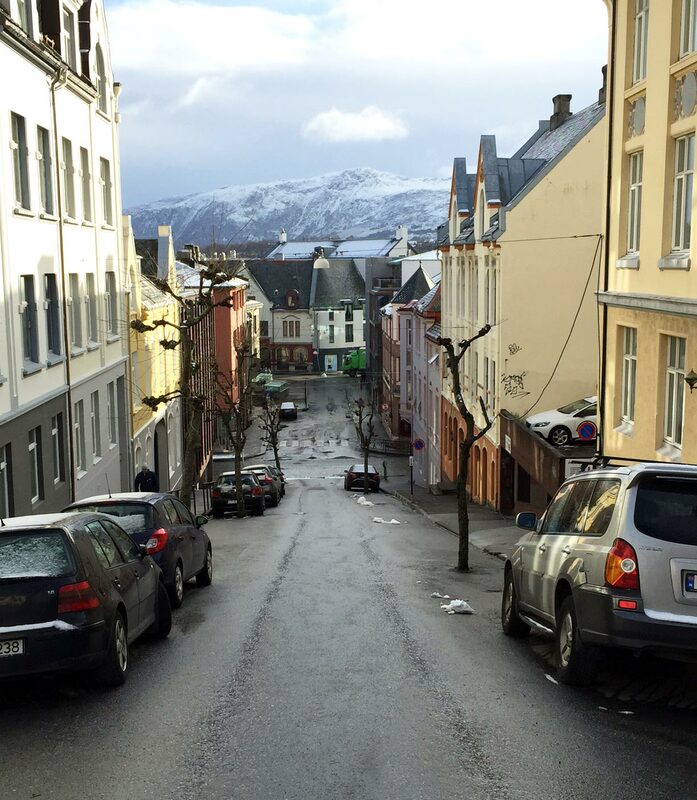 In the meantime, we visited the city of Ålesund (pronounced Oh leh sund), which I had never even heard of before visiting. 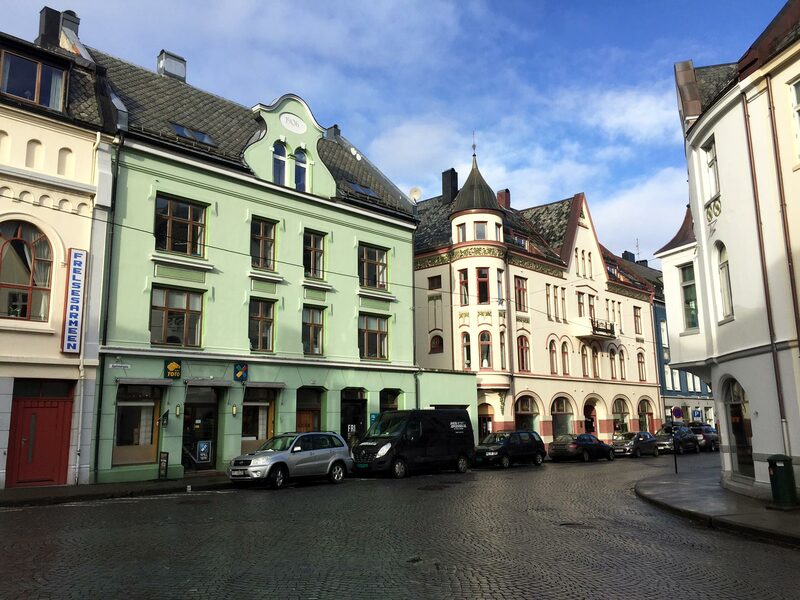 A fire consumed much of the city in 1904, so many buildings were rebuilt in Norway’s version of the Art Nouveau style. Quintessential Art Nouveau draws it’s influence from nature and is usually asymmetric. 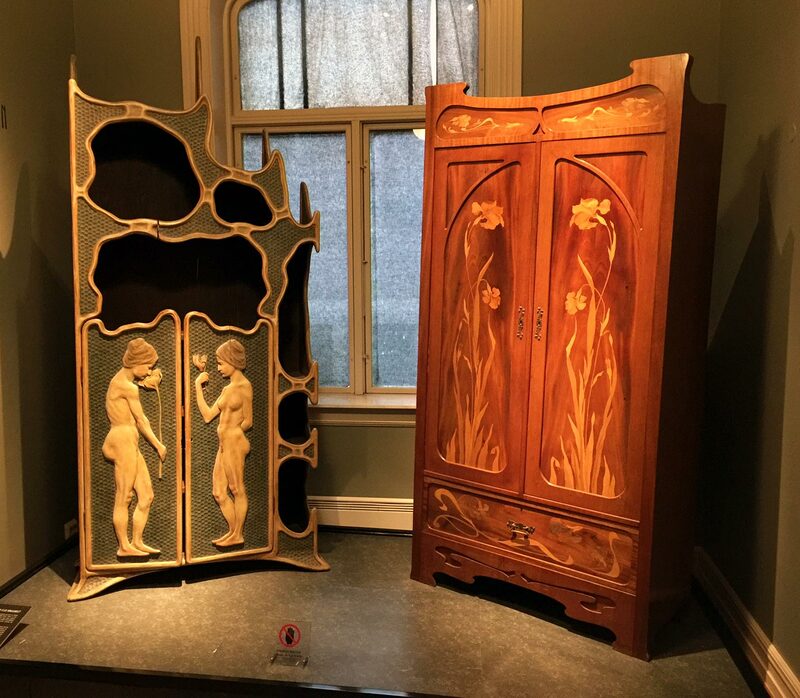 Norwegian Art Nouveau is more like the transitional period in the 1910s between the Art Nouveau and Art Deco movements. The themes from nature are more stylized than realistic and the decoration is mostly symmetric (two characteristics of Art Deco). 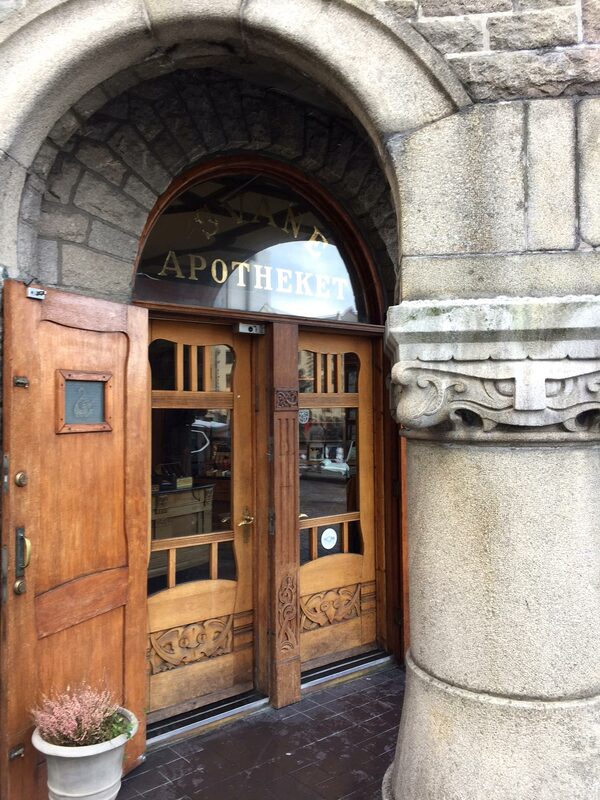 We visited the original Art Nouveau pharmacy, which is now the Art Nouveau Center of Ålesund. It’s a small museum now with a limited selection of items, including four low quality Gallé vases and one nice blue decorated Tiffany Favrile vase, but it was still interesting. Be careful how you park! It’s a charming, clean city with friendly people. I’m glad we visited, even for a brief while. Art Nouveau buildings were a nice surprise. When we return, we’ll prepare for our next show, the Charleston Antique Show in Charleston, SC, March 17-19, 2017. I have no idea what to expect since I’ve never exhibited there, but I figure it’s worth a shot. I have low expectations and am hoping for a nice surprise. I’ve been listing on my website many of the new items I’ve recently purchased and I’ll be listing more in the near future. Please check my site as often as you can. 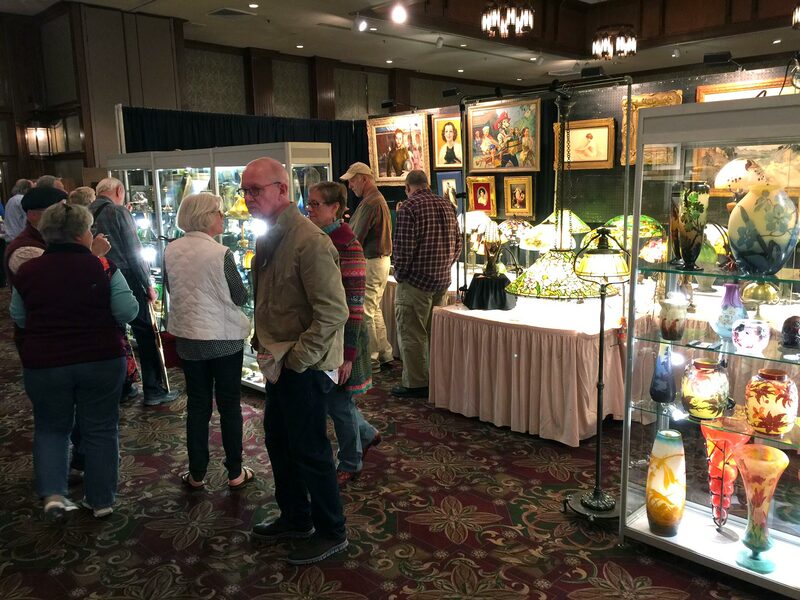 The National Arts & Crafts Conference finished its three-day run yesterday at the Grove Park Inn, Asheville, NC. 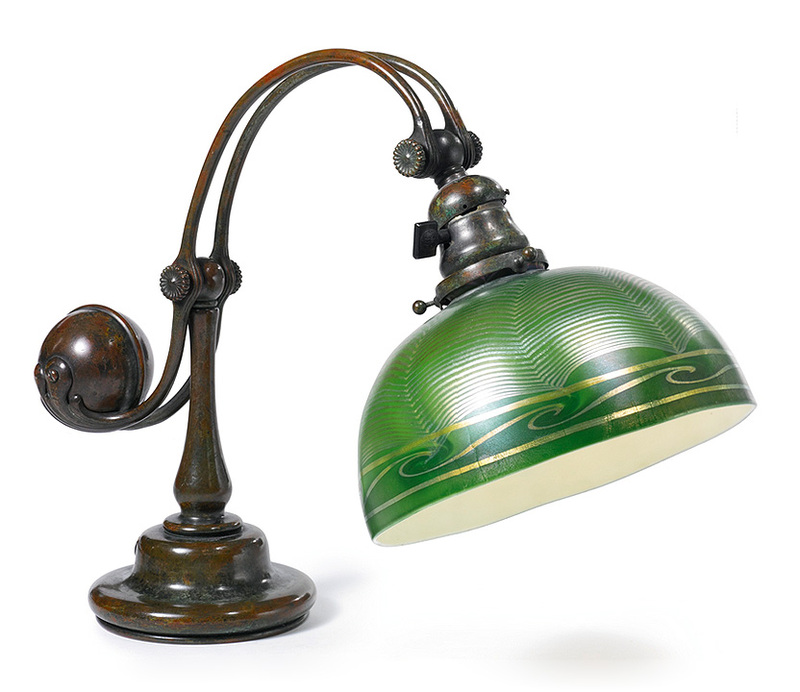 In contrast to our shows in Miami, Tiffany Studios lamps, glass and desk set items sold best. Attendance and interest seemed better than last year, which was a good year. This show is unlike any other we do. True collectors and decorators fly in from all over the country to attend. 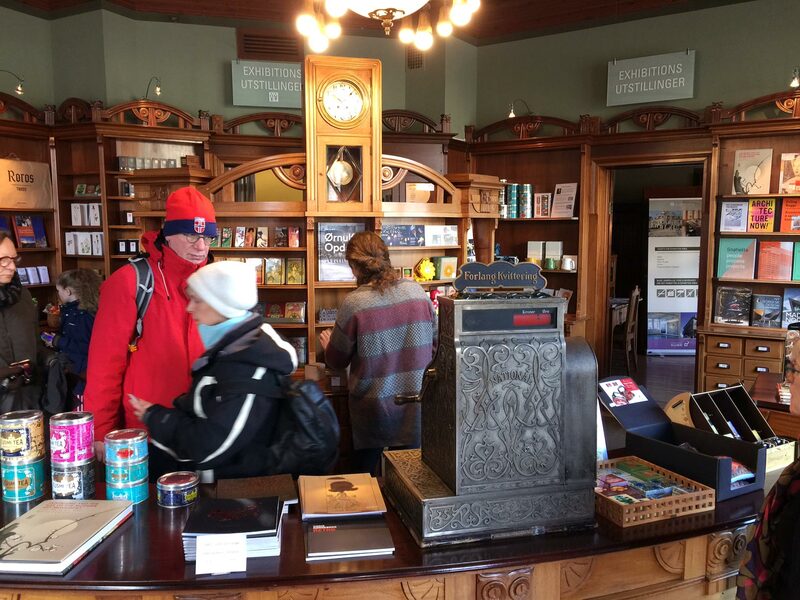 Most are knowledgeable, courteous and friendly. It’s a real pleasure to exhibit at this show. We look forward to next year’s show. I was busy on Sunday on a short day, from 11 AM to 4 PM, so I didn’t have a chance to record other dealer’s reactions. However in asking around most dealers were quite upbeat. I saw sale after sale. The UPS packer on the show floor was busy every minute of every day. It was very refreshing. I recorded a short video of the show. Click here to view it. After exhibiting at four shows in the last few weeks, we’re off on a brief vacation to view the Aurora Borealis. If we get lucky, we’ll see it and I’ll write a blog with photos. I will have complete access to my email, so don’t hesitate to write. I’ll answer as soon as I finish drinking my Cuba Libre. 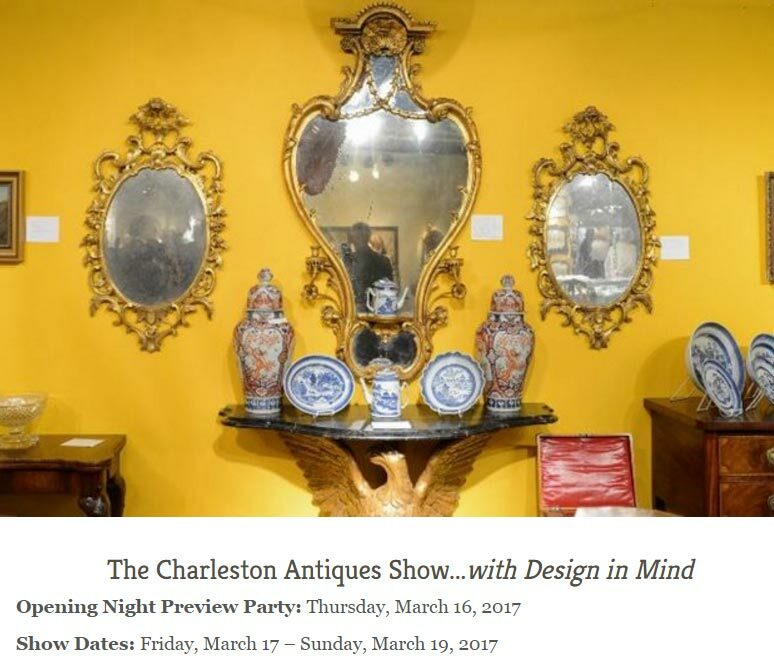 Our next show is a new one for us, the Charleston Antique Show in Charleston, SC, March 17-19, 2017. I have no idea what to expect since I’ve never exhibited there, but I figure it’s worth a shot. I have low expectations and am hoping for a nice surprise. No Thursday post this week because this week’s post was postponed to Tuesday. 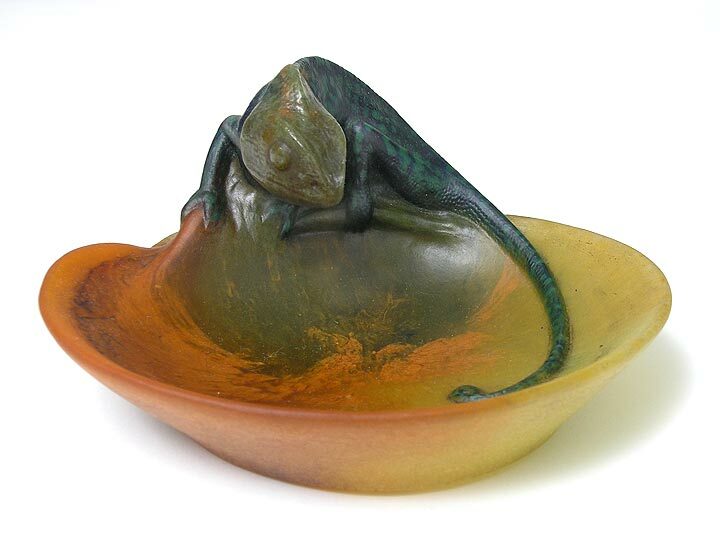 Next Monday’s post will have the results of The Grove Park Inn Arts & Crafts Conference. 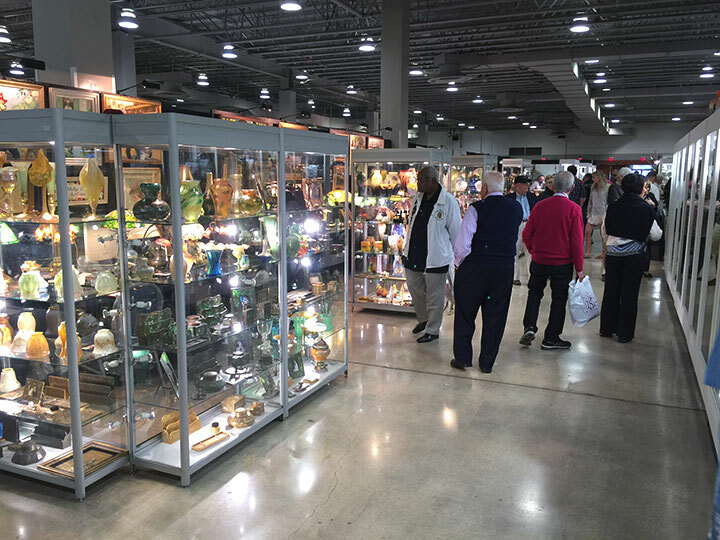 The Original Miami Antique Show finished its four-day run yesterday at its new venue, the Miami-Dade County Fair Expo Center. We had a reasonably good show, especially compared to my low expectations. French glass sold best, as usual. In asking around, some dealers did fairly well and others complained bitterly. Here’s some of the scuttlebutt surrounding the show. 1. Many of the dealers and attendees were satisfied with the new location because of the extensive free parking. You probably remember what a pain parking was in Miami Beach. 3. 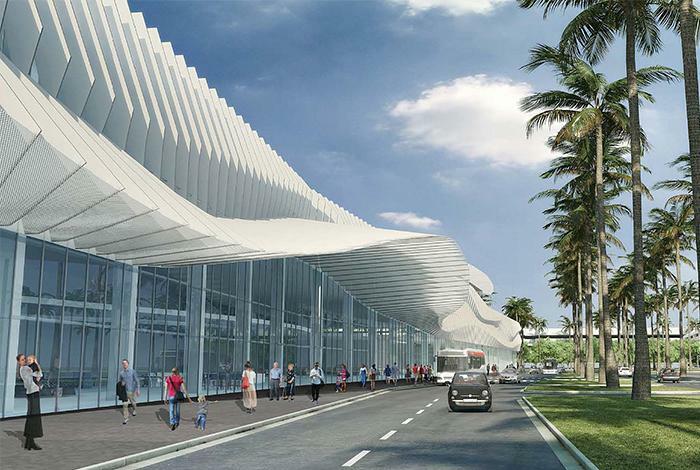 Rumors had been circulating since last year that the show would not be permitted back into the Miami Beach Convention Center after construction is complete. The latest information is that was totally untrue. The show will move back into the Convention Center in January or February, 2019, if the construction is complete. That means only one more year at the Miami-Dade County Fairgrounds. Here’s hoping. 4. Other rumors had it that the Miami-Dade County Fairgrounds was in an awful neighborhood in cow country. Again, totally untrue. It’s in an up and coming neighborhood that is perfectly fine and totally safe. I recorded a short video of the show including several dealers reactions. They skew to better comments because most of the dealers who did poorly were unwilling to go on camera to say so. Click here to view it. 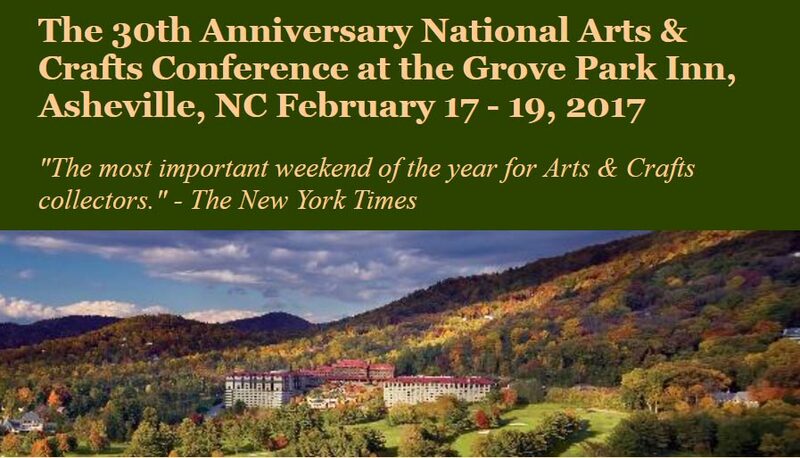 Today we’re off to the historic and beautiful Grove Park Inn in Asheville, NC for the Arts & Crafts Conference this coming weekend. It’s one of our favorite shows of the year, which you will surely enjoy if you make the effort to attend. Hope you can make it. I spent a lot of time on Monday creating a video of last week’s show, the Miami Antiques + Art + Design show. It’s not a polished, professional presentation, but I think you’ll enjoy watching it. Click here to view it. PLEASE send me an email and let me know what you think. philip@chasenantiques.com. 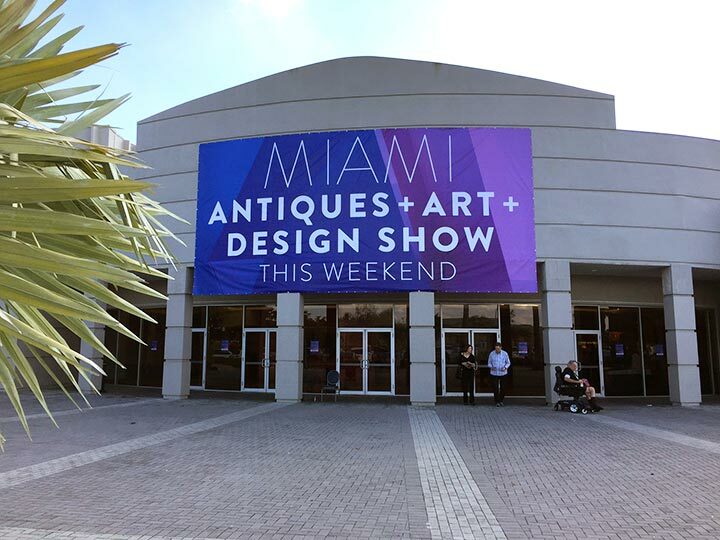 Yesterday was the first day of setup for the Original Miami Antique Show at its new venue at the Miami-Dade County Fair Expo Center in southwest Miami. I didn’t know what to expect and truly I was surprised. It’s an extra 15-20 minutes drive, but I assure you it’s worth it. The show is huge with many, many high-quality dealers. I can’t think of a better show to travel to. The quality and the size make it a must-see show! I’ve put together a very short video to give you a little taste. Click here. The show opens to the public this Friday at 11 AM and continues until Monday at 5 PM. Make sure you visit!! We’ll have this just-purchased, incredible Daum Nancy Blackbird vase at the show. We always bring a strong inventory to Miami, but this year is exceptional. You won’t believe the quantity and quality of the French and American glass and lamps we’ll have at the show. We had to rent an additional showcase beyond the eight we already bring just to fit it all. Come and visit the show. It’s always good but this year it will be great! The Miami Antiques + Art + Design Show is over. It’s been a modest success, for which I’m thankful. Attendance was light to moderate for the entire show, but enough of the right people showed up to make it profitable. French glass sold best, which has been the usual modus operandi for most shows. I don’t think the word is out yet that the show is new and improved. It’s much larger and better, so it’s worth a trip from anywhere. I think the show is going to get even bigger next year with the reopening of the second floor. That would be a great reason to visit. We’re signed up for next year in an even bigger booth. I spent a lot of time on Monday creating a video of the show. I’m not a professional videographer, but I did my best with a complicated video editing program called Serif MoviePlus. Click here to view it. I would love to know what you think. PLEASE send me an email. philip@chasenantiques.com. 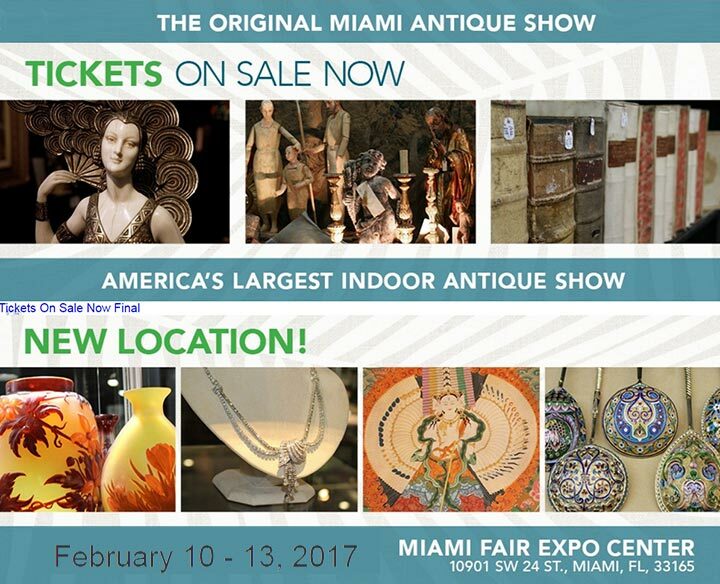 This week we’ll move to the Miami-Dade County Fair Expo Center in southwest Miami for the Original Miami Antique Show. It opens to the public this Friday at 12 PM and continues until Monday at 5 PM. I have no idea what to expect with this move to a new venue. I’ll keep you posted. Setup at the The Miami Antiques + Art + Design Show is half over. It’s going smoothly, but we have so many objects that it’s a formidable task. We’ll have it all done by the time the show opens to the public this Friday at 11 AM. This year the show has 200 dealers, up from 60 last year. It’s a rare example of a show growing, as most shows are struggling just to maintain their size. Many of the best dealers who haven’t exhibited at this show in many years are back. It’s like the good old days. You will be thrilled with the size and quality of the show. Come visit and make the show a big success! 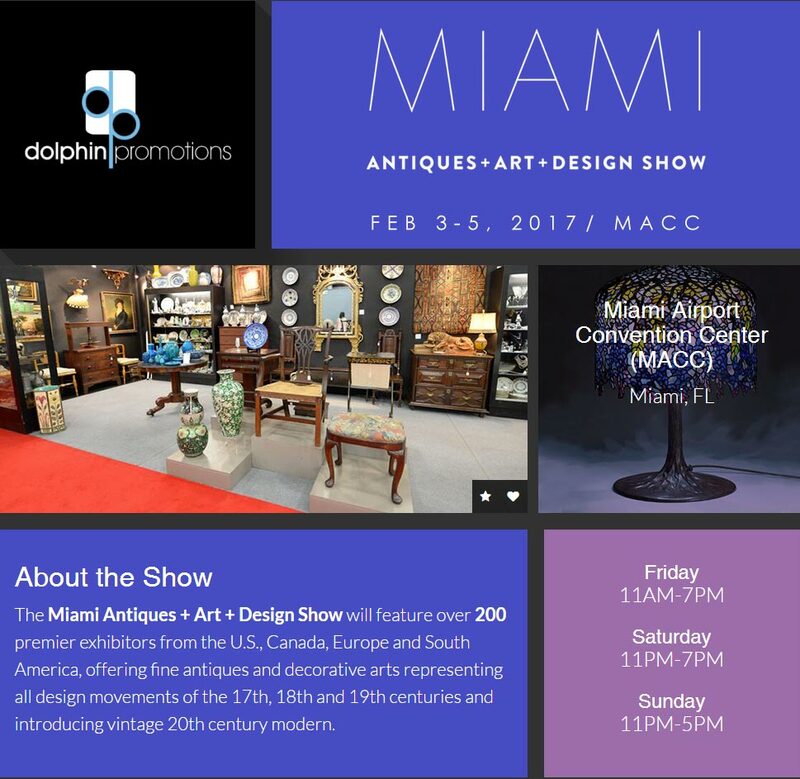 The Original Miami Antique Show follows the Miami Airport Show, moving from Miami Beach to a new venue. If you can’t make both shows, make sure you visit this one.